Fun Fact Friday: Internet Ad Spend Surpasses $69 Billion! In 2016, online ad spending in the United States alone surpassed $69 Billion! It is expected to grow almost 15% this year, which represents another $10.3 Billion. The online opportunity for advertisers is still growing believe it or not. The United States spends the most on ads globally. With an expected increase of approximately 15%, marketing analysts are forecasting ad spend to close out at a total of $80 Billion this year. Globally digital ad spend has finally surpassed TV advertising. 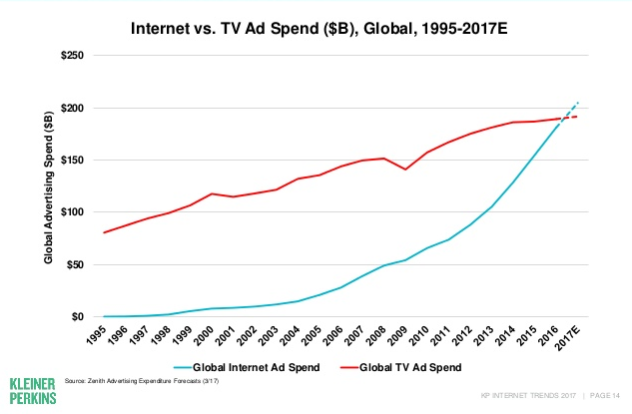 This year digital marketers are on track to exceed $200 Billion in advertising around the world. Today’s Fun Fact Friday is from Adage and their amazing 2017 Marketers Fact Pack. All screenshots by Chandal Nolasco da Silva. Taken June 2017.